Ideal Tax Solution, LLC continues to monitor all aspects of informational releases disseminated by the IRS. Data analysis announcements, such as the Statistic of Income (SOI) Bulletin, are important for the development of long-term strategies which reflect taxpayer trends. It never ceases to amaze me how many different clients share a common problem. Ideal Tax Solution, LLC has always recognized the value of gathering and then sharing credible IRS related news announcements as they occur. The IRS Statistic of Income (SOI) Division produces SOI Bulletins on a quarterly basis, providing income data for previous years. For example, the winter 2013 edition includes data from 145 million tax returns, which were filed in 2011. Ideal Tax Solution has learned the current SOI publication also entails facts and figures from tax years 2010, 2009, and 2008. Taxpayers have long acknowledged their appreciation for the way in which Ideal Tax Solution brings informed scrutiny to a tax debt resolution process. The strongest financial service companies are the ones who best understand the potential benefits for their clients of staying current on all IRS related statistical data. 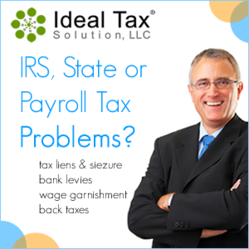 By fully comprehending tax related IRS documentation, professional tax relief specialists like the ones at Ideal Tax Solution are better prepared to interact with the IRS on behalf of taxpayers in need of serious tax problem resolution. Information released by the Internal Revenue Service is reflective of taxpayer trends, in addition to being a barometer for the effectiveness of existing tax code policy. Analyzed data from the IRS is also a good source of knowledge for taxpayers interested in following a quantitative breakdown of tax revenues collected by the federal government. Ideal Tax Solution keeps a daily watch on IRS news reports, whether for informational purposes or more serious tax liability issues, such as negotiating resolution for taxpayers who suddenly find themselves in delinquent taxpayer status. Printed versions of the SOI Bulletin can be obtained by ordering them from the Superintendent of Documents, U.S. Government Printing Office, P.O. Box 371954, Pittsburgh, PA 15250-7954, or by visiting the IRS.gov website. Recent or existing IRS information on any tax related subject can also be attained by simply contacting Ideal Tax Solution.